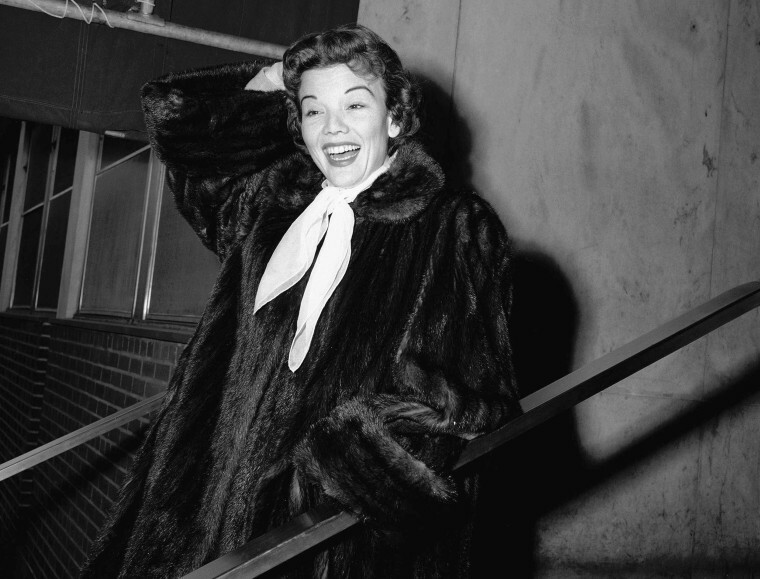 LOS ANGELES — Nanette Fabray, the vivacious actress, singer and dancer who became a star in Broadway musicals, on television as Sid Caesar's comic foil and in such hit movies as "The Band Wagon," has died at age 97. Fabray died Thursday at her home in Palos Verdes Estates, her son, Dr. Jamie MacDougall, told The Associated Press. He said the cause was old age. "She was an extraordinary woman. Many people referred to her as a force of nature and you could feel it when she walked into the room," her son said Friday. "She just exuded warmth, wit, charm, love, and she touched so many people in so many ways. I hope all of us can look back on our lives and be able to say that at the end of our lives." Fabray was just 3 when she launched her career as Vaudeville singer-dancer Baby Nanette. She went on to star on Broadway in such musicals as "Bloomer Girl," ''High Button Shoes" and "Mr. President," playing first lady to Robert Ryan's commander-in-chief. "Love Life," a 1948 show with songs by Alan Jay Lerner and Kurt Weill, won her a Tony in 1949 as best actress in a musical. "Mr. President" brought her a second nomination. After another musical, "Make a Wish," MGM brought her to Hollywood to co-star with Fred Astaire, Cyd Charisse and Jack Buchanan in the 1953 film "The Band Wagon." The Comden and Green musical, satirizing artistic pretentiousness vs. old-fashioned show business, features such classic numbers as "That's Entertainment" and "Triplets," in which Fabray, Astaire and Buchanan dress up as babies. "Unfortunately, I was coming in when big musicals were going out," Fabray would say later. "So the buildup didn't go anywhere except to lead me back to New York." Back on the East Coast, she found her biggest audience as a co-star in the pioneering television show "Caesar's Hour," which brought her three Emmy awards. She won them despite a hearing disability that had plagued her from childhood into her late 40s. "In school I would try my best but I would fail course after course," she said in a 1967 interview. "I thought I wasn't very bright, but actually that wasn't it at all. I just wasn't hearing." She managed to get by in adulthood by making her family and friends speak up. Finally, her husband, screen writer-director Ranald MacDougall, persuaded her to get a hearing aid. She wore it offstage and on and talked openly about her disability on behalf of organizations concerned with hearing loss. In 1967 she underwent surgery that gave her normal hearing for the first time in her life. "She had such an amazing life professionally, but I think if she could say what she wanted to be remembered for it would be more for her humanitarian work," said her son. "She was very instrumental in advocating for the rights of the deaf and hearing impaired." In addition to "Caesar's Hour," Fabray appeared in such popular 1950s television anthologies as "Playhouse 90" and "The Alcoa Hour." Other TV appearances included "Laramie," ''Burke's Law," ''The Girl From U.N.C.L.E" AND "Love, American Style." Later TV roles included that of Bonnie Franklin's mother in the hit 1980s sitcom "One Day at a Time." And in the 1990s Fabray played mother to Shelley Fabares, her real-life niece, in the hit sitcom "Coach." Fabares herself had begun her career as a child actress, playing Donna Reed's daughter in the long-running "The Donna Reed Show" of the 1950s and '60s. Born Ruby Bernadette Nanette Fabares in San Diego on Oct. 27, 1920, Fabray changed the spelling of her last name to match the way it was pronounced. After launching her career in Vaudeville, she studied drama and voice for several years before winning the role of the lady in waiting to Bette Davis' queen in her first film, 1939's "The Private Lives of Elizabeth and Essex." She went to New York soon after with the Hollywood revue, "Meet the People," remaining there to become one of Broadway's most versatile stars. "High Button Shoes," was one of her best-known Broadway shows, and a New York Times review of the time singled out Fabray in particular, saying she "sings the principal songs with a good voice and in a jaunty manner." The show also featured a complex, lengthy dance scene choreographed by Jerome Robbins that parodied Mack Sennett silent film comedies. The Times described it as "swift and insane, like a jiggly old film," calling it an inspired bit of animated entertainment. Fabray's first marriage, to TV executive David Tebet, ended in divorce. In 1957 she married MacDougall, whose writing credits include the 1963 Elizabeth Taylor film "Cleopatra." He died in 1973. Their only child survives her. He said Friday that memorial services would be private.